Mr Lasi commended the FFA for continuously raising the bar in its efforts to address IUU fishing. “Maritime security is of paramount importance to the Solomon Islands and our Pacific Island countries which cover a huge expanse of ocean area. The ability to effectively monitor our vast oceans and its resources, which we greatly depend on, is fundamental to our livelihoods and we thank the Government of Australia for its assistance with this important Program” he said. 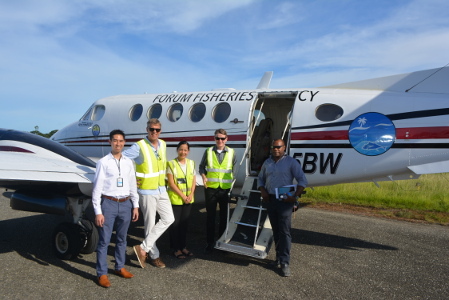 The Director General thanked the Solomon Islands Government for their cooperation in ensuring the aircraft was provided all the necessary clearances and support to undertake surveillance in the Solomon Is EEZ on behalf of the government. The Aerial Surveillance Program is a component of the Australian funded Pacific Maritime Security Program (PMSP) which is a 30-year commitment by Australia to regional maritime security. Under the Program, Australia has contracted a civilian air surveillance service provider to conduct the surveillance using two King Air aircraft that are fitted out with state of art sensor avionics and communications technology. Operational control of the Program rests with the FFA.